The Global Volcanism Program has no activity reports for Paulet. The Global Volcanism Program has no Weekly Reports available for Paulet. The Global Volcanism Program has no Bulletin Reports available for Paulet. Paulet is a small 2.5 x 3.5 km island located east of the tip of Graham Land Peninsula. The pear-shaped island is composed of lava flows capped by a well-preserved cinder cone with a small summit crater. The youthful morphology of the volcano was thought to indicate activity during the last 1000 years (LeMasurier and Thomson, 1990). Residual heat keeps the island largely ice free throughout the year. Baker P E, Gonzalez-Ferran O, Vergara M, 1973. Paulet Island and the James Ross Island volcanic group. Brit Antarctic Surv Bull, 32: 89-95. Baker P E, Gonzalez-Ferran O, Vergara M, 1976. Geology and geochemistry of Paulet Island and the James Ross Island volcanic group. In: Gonzalez-Ferran O (ed) Proc Symp Andean & Antarctic Volcanology Problems (Santiago, Chile, Sept 1974), Rome: IAVCEI, p 39-47. There is no Deformation History data available for Paulet. There is no Emissions History data available for Paulet. Paulet is a small 2.5 x 3.5 km island located east of the tip of Antarctica's Graham Land Peninsula. 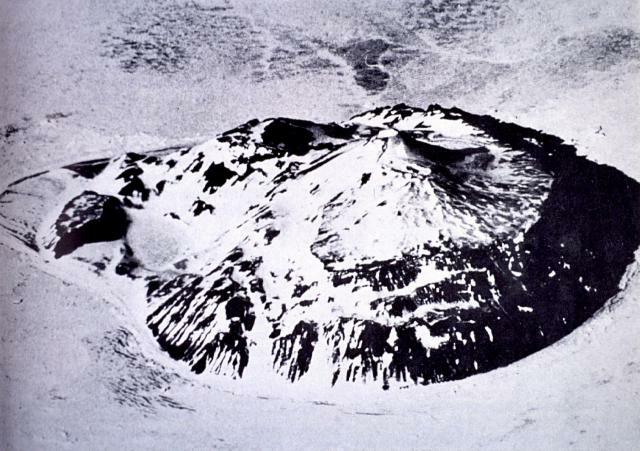 The pear-shaped 353-m-high island, seen here in an aerial view from the west, is composed of lava flows capped by a well-preserved cinder cone. The cone, located at the southern end of the island, contains a small circular summit crater. 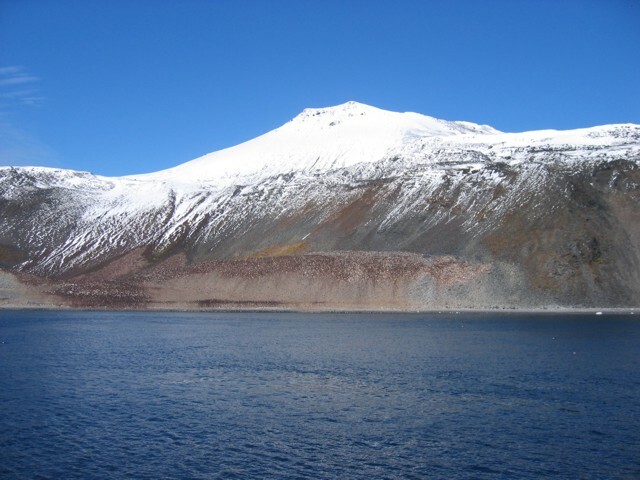 The youthful morphology of the volcano and residual volcanic heat that keeps the island largely ice free throughout the year suggest activity during the last 1000 years. Photo published in González-Ferrán (1995). Paulet Island, seen here from the NW, is a small 2.5 x 3.5 km island located east of the tip of Graham Land Peninsula. A basal sequence of horizontal lava flows exposed in steep cliffs is capped by a well-preserved cinder cone (top center) of Holocene age with a small summit crater. The darker brownish areas near and above the shoreline at the center of the photo are Adelie penguin colonies that are the frequent object of Antarctic tours. Photo by Jeff Post, 2007 (Smithsonian Institution). The Global Volcanism Program has no maps available for Paulet. There are no samples for Paulet in the Smithsonian's NMNH Department of Mineral Sciences Rock and Ore collection. Large Eruptions of Paulet Information about large Quaternary eruptions (VEI >= 4) is cataloged in the Large Magnitude Explosive Volcanic Eruptions (LaMEVE) database of the Volcano Global Risk Identification and Analysis Project (VOGRIPA).